you sound like me w/your nursery. i bought a ton off craigs list...i honestly don't remember ANY furniture or accessory that i bought new. 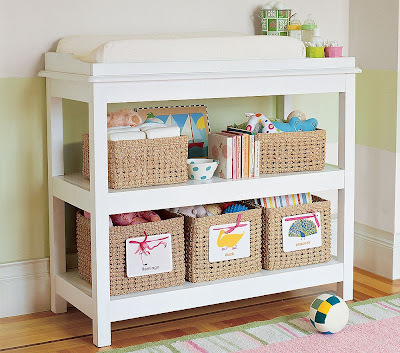 we got the white pottery barn kids sleigh crib w/mattress for $200 off craigs list. a brand new (b/c their kid didn't like it) chicco high chair for $40. a maclaren for $75. a new swing for $30. it's such a high to get things for cheap. We haven't started nursery preparations yet. Honestly I'm not even sure which room we're going to use yet! I got an idea over the weekend about doing some built-in cabinets in one of the rooms so I'm hoping that will eliminate the need for at least some of the pricey furniture. We'll see! Luckily I have tons of time! Kathleen - that's exactly what we're doing - built-in shelves all along to back wall, which is why we're keeping the furniture sweet and simple! Adorable!!! We are just getting started with our nursery preparations. I have painted an antique armiore and will paint the dresser soon. 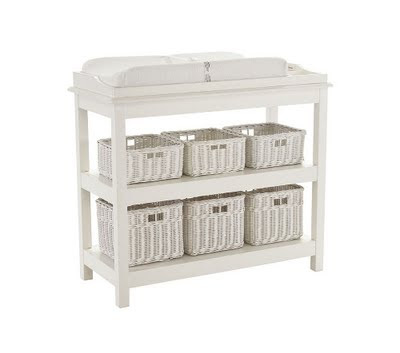 I found a great deal on a 2-in-1 crib/changing table at Target.com (but haven't purchased it yet). With our limited space, I didn't want a separate changing table as I don't even know how often I will use it. So far, our only major purchase has been our plush glider/ottoman...it arrives in a week! Yayyyy for an awesome purchase! Don't you just LOVE Craigslist? I am currenlty searching them up and down for a nice dining room set. I can't wait to see the entire nursery put together. It sounds like it is going to be just precious! They look great. And those are some wonderful deals. I can't wait to see what you do with the nursery - you're SO much better at this stuff than I am. Love your finds so far!! Haven't had time to comment in a while and wanted to say congrats! I got my PB sleigh crib off Craig's list and was pretty excited about it too! That's great! We bought the same changing table off craigslist a little over a year ago for my daughter's room. It's so FUN to get a deal!